The next instalment of JWP Amateur tournaments is here! June 18th at the Broadbeach PCYC. 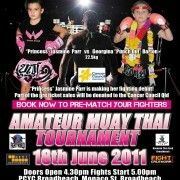 Its gonna be a great day with “Princess” Jasmine Parr making her fighting debut! Click the image to see the event video trailer. WOW! you go girl! following in your dad’s footsteps! I am hoping to compete in the next amateur tornament, as my dad ( Geoff Hackett) said that i would be ready and i have been working with Adrian. Great work Jasmine!